This page gives example sounds for each of the templates. The templates (as well as the SysSon software) may be downloaded from github, where you also find their documentation. The sonification targets one-dimensional data. It can be played directly as so-called „audification“, using a normally high sampling rate (in the order of several thousand samples per second), or zoom into a region of the data set with a pitch shift and modulation, leading to an „auditory graph“. You may find details on the sound synthesis in this paper. Reading out the data slower, e.g., with one fourth of the original sampling rate (11 kHz) is still a highly compressed signal in time, but some differences can be heards (year 07-08 seems to be a rougher sound). 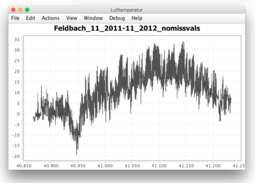 Zooming into the data set, e.g. listening to 732 data points (corresponding to one month) per second would lead frequencies far beyong the human audible range. Therefore, we use augmented audification, with a frequency shift of 300Hz and a pitch modulation factor of 1 octave. With this setting, the yearly cycles can be compared to each other. With an even slower read-ut of 168 data points (i.e., one week) per second, we compare the two Januaries. 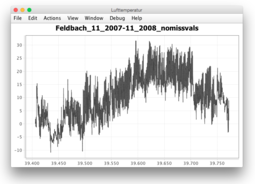 The more jittering („complaining“) sound of the year 07-08 as compared to the year 11-12 hints to a large storm that took place in the beginning of January 08, with more quick temperature changes involved. 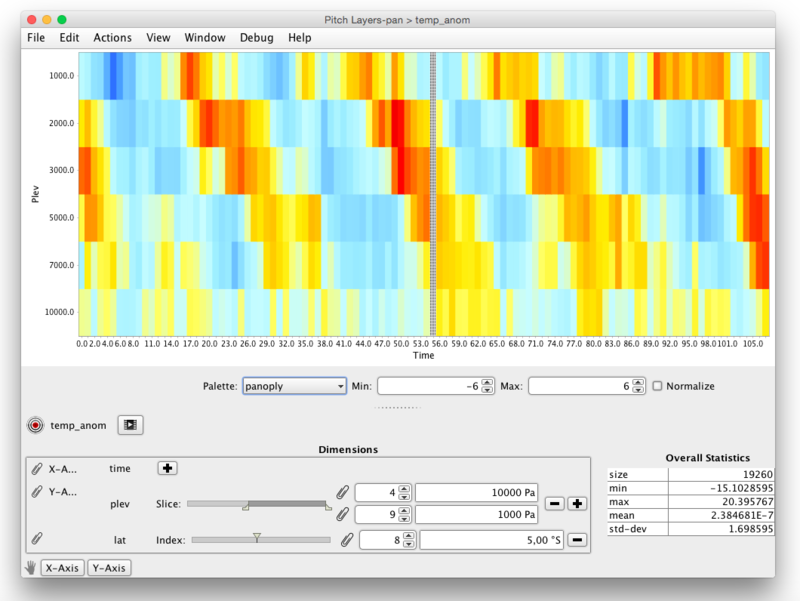 The PitchLayers template was created for anomaly data, and may show the quasi biennal oscillation (QBO), which is found in higher altitudes (given as pressure levels) around the equator, and results in an a-synchronous rhythm of roughly 2.5 years as compared to the ticking signal that indicates one year. When playing all pressure levels are played, the lower glissandi are not clear anymore. This behaviour is not at all reproduced in mid-latitudes (15 deg N - 35 deg N). Resonant Rain is the most complex template provided here. It can be used for any two-dimensional data set with the anomalies of two variables: our example plays precipitation and temperature data, who influence the sound quality in various ways. 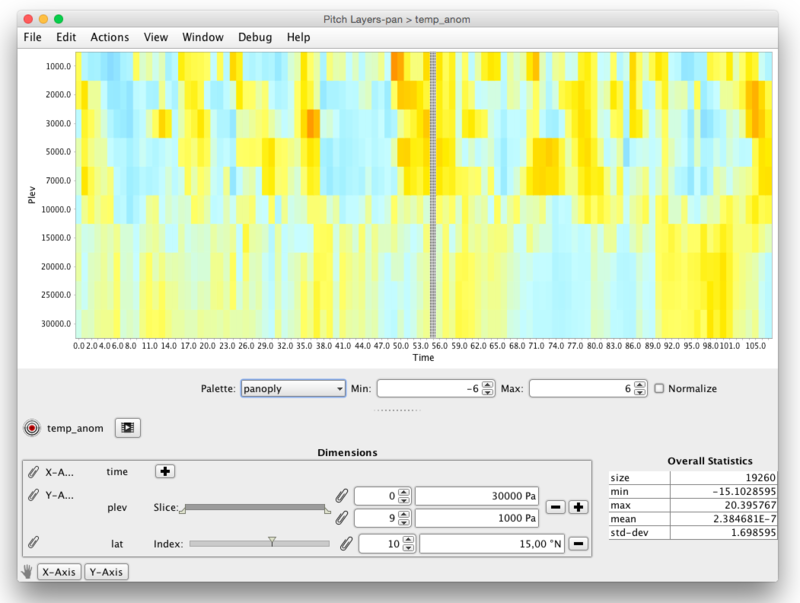 The calibration file is adjustable to understand the different sounds of the sonification. The basic sound with both anomalies around zero. This is the neutral, rather calm sound. If both rain and termperature are unusually low, the sound is scarcer and has lower resonances. If both rain and temperature anomalies are high, the resulting sound is dense and high-pitched. These sounds span the timbre space in which the sonification realizes the sounds from real data.